But illegal trafficking of wildlife, and shipping as a transit source for the trafficking, is starting to get the attention it needs. Sail Transport Network and SAIL MED share a mission of ensuring responsible shipping in all areas that affect wildlife, the seas, our air quality and health. So we created this article for your interest. The United Nations kicked off on June 6, 2016 at its New York headquarters the first World Wildlife Crime Report: Trafficking in Protected Species. It draws upon primary data to create an alarming overview and analysis of the global trafficking in flora and fauna. Along with elephants (one is killed every 15 minutes by poachers), nearly 7,000 different species have been accounted for in more than 164,000 seizures affecting 120 countries. 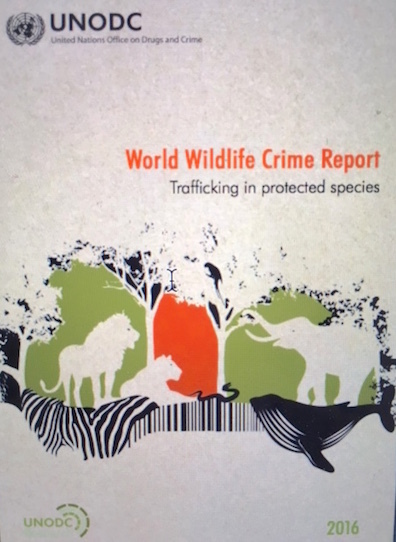 Representatives from Gabon to Germany, Kazakhstan, Colombia, Italy, Interpol, Sri Lanka, Kenya and many others gathered at the United Nations in New York to launch the report and speak up against illegal trafficking in wildlife. The problem spans across the world's greedy consumption habits in more ways than what we might have assumed. It isn't just ivory chess pieces and reptile handbags that cause killings. The demand is fueled by many unnecessary and trophy consumption habits for certain kinds of seafood, pets, zoos, and breeding, food, medicine, and tonics, art, décor, and jewelry, cosmetics, perfume, fashion and furniture. The Report helps to elucidate how widespread the problem is. "From fashion to furniture, food to pets, the products of wildlife and forest crime may be hidden in plain sight, part of our everyday lives, all over the world. We are all potentially complicit, and we all share a responsibility to act where we can." 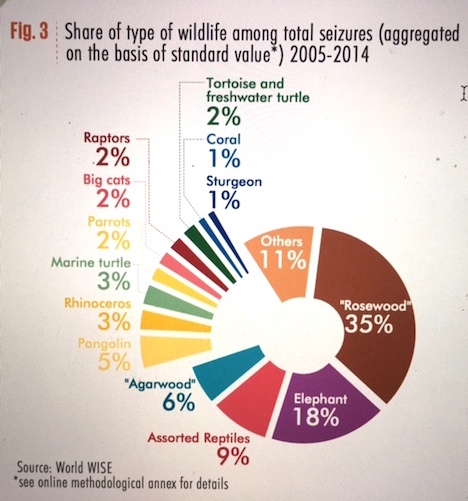 The list of illegally trafficked species generated by the Report sits in a World Wildlife Seizure database (World WISE) to help countries share information. The database, however, is not yet comprehensive. This is because it draws on seizure records obtained from actions carried out pursuant to the Convention on International Trade in Endangered Species of Wild Fauna and Flora (CITES). For various reasons, CITES does not contain all species trafficked; nor does it protect against certain crimes against wildlife. For example, poaching and illegal domestic trade of protected species does not fall within the scope of CITES. The Report also explains some of the other loopholes in international conventions and states laws, which allow traffickers to deal in wildlife. For example, countries generally do not recognize other countries' laws on illegal harvesting and poaching of wildlife, and illegally acquired wildlife can be legally traded in most countries around the world. There is also the problem of the false provenance: where exactly did that shipment of Rosewood come from? Illegal trafficking in wildlife has devastating far reaching effects. Local populations are losing wildlife cultural heritage, local resources, income sources (i.e., eco tourism), stability in their villages, forest and land resources, and also loved ones, as wildlife trafficking results in related killings. Where does maritime shipping come into the picture? Large ships are often a source of transit for the trafficked wildlife. Many of the species trafficked by sea cannot be hidden in boxes and containers. As the Report explains. species such as rosewood are so bulky in marketable quantities that shipments are difficult to conceal, while live animals such as parrots or raptors may require special conditions to arrive intact. Also, the international illicit trade in live great apes, for example, would not be possible without corruption. "Even as infants, apes are large, powerful, and too valuable to lose in transit." So imagine what such a shipment of reptiles, apes and logs of rosewood must look like on a boat (probably with some firearms, ancient statues and diamonds in the mix too): it equates to a Noah's Ark Gone Awry. A ship of death for species that deserve to be and are worth much more alive than dead. So who is letting all these trafficked species aboard? The IMO has begun to acknowledge the problem. It became a member of the recently formed United for Wildlife International Taskforce on the Transportation of Illegal Wildlife Products. 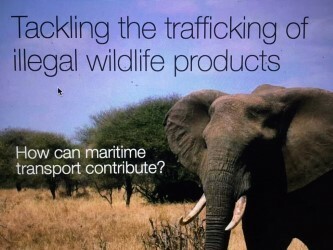 As stated on the Taskforce's website, "The Transport Taskforce was created as a way for United for Wildlife to work with the transport industry to identify any role it plays in illegal wildlife trade, and looks at the ways that the sector can break the chain between suppliers and consumers." But words on paper are not enough. Actions, and changes in shipping activities need to follow. Sail Transport Network and SAIL MED, which share a mission of ensuring responsible shipping in all areas that affect wildlife, the seas, our air quality and health, will monitor the IMO's activities in this regard to help ensure that the IMO is indeed doing what it should be doing to break the chain between the demand side and supply side of countries' trafficked wildlife. We will also write to the other maritime related signatories of the Taskforce, such as the UK Chamber of Shipping, the Maersk Group and the Cruise Lines International Association, to see how they are going to clean up complicit shipping practices. We will also follow up on the 2015 IMO publication, "Tackling the Trafficking of Illegal Wildlife Products," to see what is really occurring to stop the trafficked wildlife from being on board and to keep all the flora and fauna in their rightful homes. If you would like to help us in this endeavor, please contact the writer via email: Charlene "at" sailtransportnetwork.org. Charlene Caprio, Esq., is Sail Transport Network's and SAIL MED's Policy and Strategy Consultant. She attended the UN meeting on June 6, 2016 for the world's first World Wildlife Crime Report. See IMO 2015 report, Tackling the Trafficking of Illegal Wildlife Products, IMO News, Issue 2, 2015. available at: imo.org. For further reading, the U.S. has recently adopted regulations that will create a near-total ban on the commercial trade of African elephant ivory, effective July 6, 2016, improving past laws concerning ivory trade. (see: nationalgeographic.com). Also, this year Sri Lanka and Kenya have both publicly destroyed large hauls of ivory tusks that were seized, demonstrating a zero tolerance for poaching. (see: theguardian.com and bbc.com). Visit the SAIL MED website. SAIL MED is based in Europe and is a project of the Sail Transport Network. The United Nations kicked off on June 6, 2016 at its New York headquarters the first World Wildlife Crime Report: Trafficking in Protected Species. Each of us should protect the wildlife of Bissau. I'm the one with it.